Leave the chickpeas to soak in cold water throughout a night. Peel and chop the onion and garlic. Wash the parsley and cilantro, dry with paper towels and chop the leaves finely using a sharp knife. Grind the drained chickpeas into a grinding with bread crumbs, onion, walnuts, garlic and herbs. Add the cumin, salt and pepper and let stand 30 minutes. Form balls of dough and fry in batches in a pan with hot oil until golden brown. Prepare the yogurt sauce whisking all the ingredients. 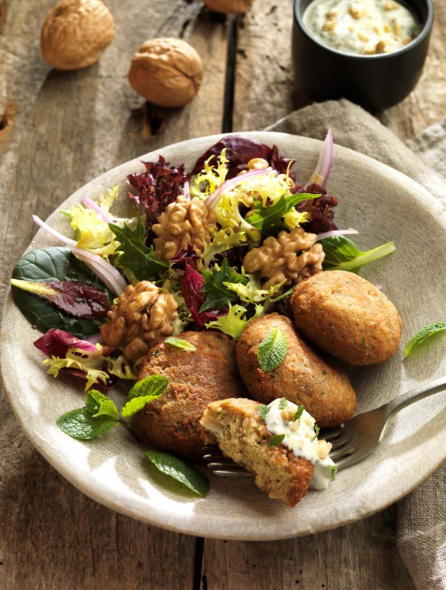 Serve the falafel with salad and yogurt sauce.